Louisa DeSaussure Duls in the Story of Little Switzerland writes that in 1920, “the Staten home was bought by a family that was to be associated with Little Switzerland for a long time”. Her vision into the future was correct because one family member still lives here today. Davis Godwin is their only grandson. Ida McDuff, and her twin brother were born in Shelbyville, Indiana. Ida, who attended college in the 1890’s, was an accomplished musician and music teacher who played guitar, mandolin, and violin, basically anything with strings. She was an avid photographer and a true woman of culture who loved prose and oratory readings. Ida married Harry Hand who worked with his father, Elijah, and identical twin brother, Carey, in the Hand Furniture and Undertaking business. Carey and Harry’s mother died in their childbirth and Harry became quite an independent adventurer and entrepreneur having his own barber shop at the age of 16. While single, he traveled west and was a cowboy on the famous King Ranch in Texas where he met outlaw Emmet Dalton. After marrying, Harry and Ida traveled for 2 years across the United States where Harry worked as streetcar conductor in San Francisco and a fireman in Walla Walla, Washington. While in Walla Walla, Ida discovered she was pregnant. They then moved to Orlando where Elijah had moved the family business and where today the original historical Hand Building still stands in downtown modern Orlando. Called “Rose Bud” by Harry, baby Harriet was born in 1911 and five years later, a son, Harry Hand Jr., nicknamed Buddy, made the family complete. The entrepreneurial spirit grew and Harry became known as an astute businessman. He operated an Ice Cream Factory in 1914 which expanded to Hand’s Ice, Coal and Wood. Harry went into real estate in 1925 and opened the Hand Auto Tourist Camp, Florida’s first. Carey continued in the Hand Undertaking business which later became the Carey Hand Funeral Home. This business still carries his name today in the Orlando area. Harry became Sheriff of Orange County Florida from January 1933 to 1937 and had an amazing record. There were no kidnappings, no bank robberies, no stick-ups, no riots or lootings, no con games during this term. He was said to have kept Orange County virtually “free of crooks” during his term of office. In 1920, Ida purchased the Little Switzerland home after driving alone from Orlando in a Model A Ford, a true pioneer woman for her time. The home was located on Bearwallow Road with 26 acres of land that stretched to the top of Grassy Mountain. Here Ida and Harry would spend their summers. Arriving by train at the Switzerland Station with Harriet and Buddy, the family and their maid would travel by hack to the summit, trunks loaded with provisions for the summer. Rooms at the home were rented to guests to enjoy the cool mountain air. Spending summers in Little Switzerland, the Hands became close friends with Fons and Jane McKinney and their four daughters, Edith, Ida, Mickey and Thelma. Ida Hand spent summers teaching music lessons and giving cultural readings at Geneva Hall and at the Piedmont Theatre in Spruce Pine. Harriet spent her last year of high school living with the McKinney’s and graduated from Lees McRae High School, now a college in Banner Elk. Harry and Ida also purchased additional land in Little Switzerland including lots on Laurel Lane and Chestnut Grove Road and several hundred acres on Rich Knob. Elijah Hand’s second wife, Clara Niven purchased the Van Ness home on High Ridge Road. After the death of Carey Hand in 1945, Harry and Ida left Orlando and moved permanently to Little Switzerland. Harriet married Julian Davis Godwin Sr. in Orlando and Buddy married a girl from Penland, Mary Louise Bailey. In 1948, Harriet and Julian moved to Little Switzerland with their three children, Juliet, Davis and Catherine. Julian became the first licensed real estate broker in Little Switzerland and his original NC real estate license # 619 proudly hangs in the Timberline office today. Davis grew up in his beloved Little Switzerland, attending school in Mitchell County at Harris High, and spent his childhood roaming the mountains of Little Switzerland enjoying his youth. Davis and Jann live on Red Fox Lane in Little Switzerland and Jann is the owner of Timberline Properties, Inc. Family photographs can be seen at www.TimberlineNC.com . PHOTO: Davis Godwin on Thanksgiving Day 1955. 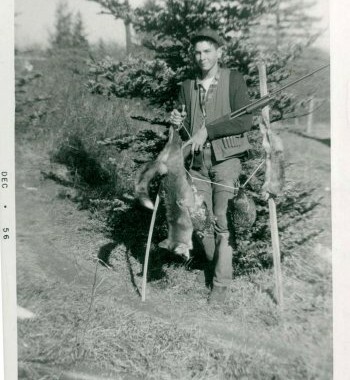 Davis loved to hunt and his catch this day was a fox, two grouse and a rabbit. Quite a Hunter!